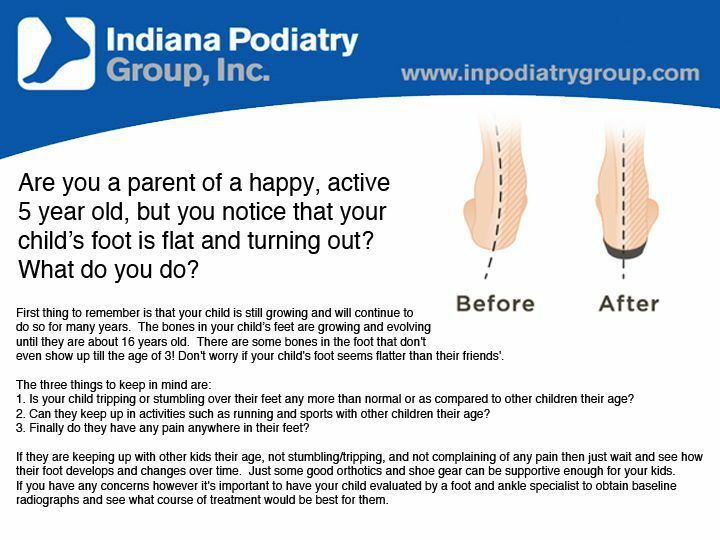 Are you a parent of a happy, active 5 year old, but you notice that your child’s foot is flat and turning out? What do you do? First thing to remember is that your child is still growing and will continue to do so for many years. The bones in your child’s feet are growing and evolving until they are about 16 years old. There are some bones in the foot that don't even show up till the age of 3! Don't worry if your child's foot seems flatter than their friends'. 1. Is your child tripping or stumbling over their feet any more than normal or as compared to other children their age? 2. Can they keep up in activities such as running and sports with other children their age? 3. Finally do they have any pain anywhere in their feet? If they are keeping up with other kids their age, not stumbling/tripping, and not complaining of any pain then just wait and see how their foot develops and changes over time. Just some good orthotics and shoe gear can be supportive enough for your kids. If you have any concerns however it's important to have your child evaluated by a foot and ankle specialist to obtain baseline radiographs and see what course of treatment would be best for them.